Stop struggling with flat PDF Files! Do you find it impossible to work with PDFs? They're big, hard to work with and don't allow you to change the data they hold. Well, no more. 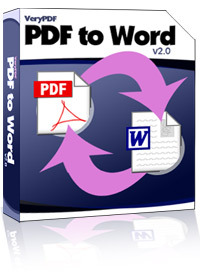 With VeryPDF PDF to Word 2.0, you can convert any PDF file to a word document, even without Adocbe Acrobat. Extract text, graphics and tables from any PDF document and preserve the layout within so you can manipulate the data within. Fast and easy conversion of difficult PDF files at an affordable price. With drag and drop ease, you can turn any size PDF document into a MS Word file so you can work with the text and images. Easy to use and feature-rich, this powerful yet affordable tool empowers you. With just a few clicks, you're converting. PDF to Word v2.0 supports batch processing, image resizing and is a standalone software, MS Word, Adobe Acrobat and Reader NOT required! Converts many PDFs, one PDF or even just a portion of a PDF quickly. Standalone software, MS Word, Adobe Acrobat and Reader NOT required! We have used several other product on the market which claim to convert PDFs but do a really terrible job. This product is by far the best coverter we have seen. It does an amazing job turning a PDF into a Word document (which is no easy task). If you've ever wished you could just get to the text in a PDF, here is the tool for you!